Using a knife effectively is an important skill in the kitchen and a good set of knives is an important piece of kitchen equipment. Japanese sushi chefs train for many years to get the slices of fish cut perfectly for sashimi, not to mention the delicate knife work that decorates their food. Trainee chefs in the UK spend a considerable amount of time during their NVQ qualifications learning good knife skills and also how to look after their knives. A decent set of knives is a good addition to a kitchen and any serious home cook would be wise to invest in a quality set with strong blades and well constructed handles. It is widely appreciated that Japanese and German brands are the hardest wearing, although most decent knife sets can last you well as long as you clean them carefully and keep them well sharpened. 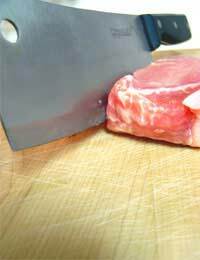 It is a common misconception that sharp knives are more dangerous. Whilst this may be true in other situations, in the kitchen and used with some care, a sharp knife can actually be easier to use and therefore cause less accidents. However, please do take every possible precaution with your knives, keep them well out the reach of children and do not allow children to use them unsupervised. It may be better to keep your quality, sharp knives just for adult use anyway. Basic knife skills start with good chopping. Practice with an onion and the largest knife in your cookware set and make sure you clear your workspace and have a good chopping board. After removing the tough outer layers, slice the onion in half from root to tip. Get used to the feel of the knife cutting through the onion and let the weight of the handle guide you, keeping your fingers tucked in carefully, as though your hand was a claw over the onion. You will need to use the medium sized knife from your set for preparing meat. For jointing a bird, it is also helpful to use a pair of scissors, although you can buy special poultry scissors, as long as you was them thoroughly a normal kitchen pair will do. For cutting and preparing meat, you may wish to use a small knife. Tasks such as taking the fat off small pieces of meat, or scoring fat on roasting joints will require a medium sized knife. Again, make sure your knife is sharp and allow the weight of the handle to guide you. Many Chinese chefs prefer to use a large cleaver for such tasks, but this can take a lot of getting used to. Many home cooks are daunted at the prospect of filleting fish, but it is very easy if you allow yourself to be guided by the fish bones and use the right knife. Your kitchen equipment should include a filleting knife – it has a narrow, flexible blade. By allowing the movement in the knife to follow the line of the main bone in the fish, keeping as close as possible to the bones, you will soon get a feel for a perfectly filleted fish. It is also worth adding a pair of tweezers to your kitchen equipment alongside your knives, specifically to be used for taking out small fish bones.